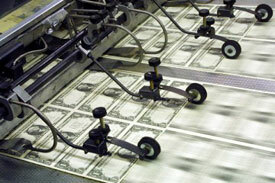 The current debate revolves around the simplified monetarist equation (which everyone accepts), that says (M•VT = P•TT) where (M) is the amount of (liquid) money in the system, (VT) is the transactions velocity of this money which is the average frequency across all transactions with which a unit of money is spent (i.e. how fast it moves from one pocket to another), (PT) is the price of goods and services being traded and (T) is an index of the real value of aggregate transactions (no it's not the number of transactions, that's included in (V) http://en.wikipedia.org/wiki/Quantity_theory_of_money)). [VT] and [T] are hard to measure and the equation can also be expressed as (M•V = P•Q) where (Q) is output, which approximates to real GDP, typically (M) is measured and (V) is calculated from (V=M/nominal GDP). The crux of the "inflationists" argument is that TARP plus TALF plus the Stimulus Package etc; represent a huge increase in (M) and this will cause inflation or perhaps worse, hyperinflation (http://seekingalpha.com/article/132543-gaping-hole-in-the-deflation-argument). The crux of the "deflationists" argument is that the (V) has gone down significantly, and in fact more than any amount of extra (M) so that means that (P) will go down, which is deflationary (Financial Markets and Economy Outlook 2009, Inflation / Deflation ). Economists are sometimes a little vague about what (M) actually is, but normally it is defined as "the total amount of liquid or near liquid assets in the economy" (http://financial-dictionary.thefreedictionary.com/Money+supply) which is either something called M3 (which the Fed decided to stop recording in 2006 although it's not hard to estimate (http://www.shadowstats.com/)), or something you don't hear much about called (L) which is M3 plus some other stuff that includes commercial paper. But this is the thing, MBS (mortgaged backed securities) and CDO (collateralized debt obligations); are counted as "liquid" in the calculation of (M). That was the whole point in the first place; you took a bunch of loans (assets) that were not "liquid" and you transformed them into securities that were "liquid" like money. One reason people did that was that the "untreated" loans were worth zilch when you calculated your capital adequacy, but the securities were treated as if they were almost cash. So the whole business of securitization created "money" outside of jurisdiction of the Fed which is why it was called the "shadow banking system". Then...well everyone knows what happened next, all those securities became "illiquid", that’s a bit like if you kept your money under the bed and they changed the currency and you went in a few years later and they said, “sorry mate – that’s worthless now”, which perhaps explains why it’s not a bad idea to get your money from the “real” banking system rather than some slickers in $3,000 suits down on Wall Street, who say theirs is better than the stuff you can get from the Fed. But the way that (M) is currently calculated assumes (a) that they are liquid and (b) that they can be valued at "face" to work out (M), which incidentally is also how BOA managed to squeeze a $2.2 billion "profit" out of Merrill Lynch by "revaluing" their toxic assets. If those toxic assets are indeed "illiquid" there is a persuasive argument that they should NOT be considered part of (M) or if they are, then if the purpose of the valuation is to calculate their contribution to the money supply (M), they should be valued at mark-to-market which if you're lucky is 30 cents on the dollar, regardless of whether or not FASB says you can value them at whatever you feel like, for the purpose of deciding if you are trading insolvent or not, so you can score 100 out of 100 on your remarkably un-stressful "stress tests" (the other word for that is forebearance). In fact forget about what should or should not happen, the reality is that if they are not liquid they are not part of (M) and however you cook the books, that "money" is in reality not flowing around the system. The kicker is that either taking those instruments out of (M) or valuing them mark to market, would take a lot more money out of (M) than is being put in under the various bail-out schemes. What the government has been trying to do for the past nine months is to replace those "illiquid" assets with cash to bring the system back basically to where it was when those assets were liquid. That's the PPIP scheme; which once was the TARP and seems to be shuddering along like a car with a flat tire whilst one flaw (or potential for a scam) after another is being pointed out, and still, after all this time, there is no clear consensus on how to value those toxic or "legacy assets" which is the politically correct term to use these days. Well if this analysis is correct then either they'd better hurry up and stop just talking about PPIP for all it's faults (not least that someone is going to make an absolute fortune at the tax-payers expense), and "Just Do It"; or forget about it and just throw money into the pond, lots of it, much more than is currently being contemplated (and someone is sure to make an absolute fortune out of that too). Either way if all of those toxic assets freezing up represented a removal of money from the economy, the government ought to be able to throw as much money as they can get their hands on, without any risk of inflation. That sounds to simple minded to be true - so how about a second opinion? How about the direct measurement of (P)...that ought to be able to reveal if there is inflation or deflation. The problem with measuring (P) is that this is also subject to error because you have to estimate the structure of the "basket" of goods and services which can possibly not accurately reflect the reality (and the fact that this is decided by a committee of economists and is subject to much political pressure doesn't help - the fact that this number is calculated by The Bureau of Labor doesn't add much to its credibility either). One big potential source of error was when in 1987 a decision was made to calculate how much consumers spend on the luxury of having a roof over their heads (called "shelter") which accounts for 20% to 25 % of CPI depending on who's side you're on. Previously (before 1987) this was calculated (for owner-occupiers) from a house-price-index. Then it was changed, first to a system where the estimator sat with a sample of home-owners and worked out how much they might have paid if they had been renting the house they lived in (owner's equivalent). Then in "order to save costs" the system was changed again to simply track rents being paid in rental accommodation and estimate "owner's equivalent rent" from that. But there is (was) a fatal flaw in this "cost saving exercise" which is that the rental market is heavily populated with poor people and (a) this is a completely separate demographic from the types of people who own their own houses and (b) it has a completely different market dynamic. For example, if a the government decided to build a couple of million low cost houses for poor people to live in at subsidized rent, well the supply of rental accommodation would go up and rents would go down, so CPI would go down. But that would have absolutely no effect on how much owner-occupiers are paying to live in their own homes, and that market comprises about 70% of the population, and perhaps 90% of the money that is spent by the population as a whole on shelter. Initially it didn't make any difference because housing inflation more or less matched CPI as it was measured under the new system, then thanks to secutitization gone mad and a fast asleep regulator, the two lines diverged. I (and others) have previously argued (Value of Housing Markets in USA and UK Past, Present, and Future ) that starting in 1995 and accelerating in 2000 the published CPI numbers did not reflect the reality, and by 2000 "real" CPI was markedly above the Fed Base Rate (which is inflationary), and I (and others) have argued that this was a major contributing factor to the housing bubble (Time for Selective Buying of Mortgaged Backed Securities? )). If you take the 20% drop in house prices in 2008 and the probable 15% in 2009 you end up cutting 4% to 5% off the CPI, that's if CPI had been calculated using the formula that was used up until 1987...so that's deflationary isn't it? So by that yardstick in 2008 there was deflation, and in 2009 there will probably be deflation, until at some point someone figures out how to unfreeze those toxic assets in which case there will be hyper-inflation, unless of course the Fed grabs the punch bowl which is by then will be pure vodka and locks it up in the closet. Much has been said about how this crisis is similar to the 1929 crisis, well in some ways it is, then there was asset price inflation caused by too much (M) just like this time, except this time the (M) that did the damage was created by Wall Street, that's new. Well there is a complication because when house prices were going up, if you asked someone with a 100% mortgage how much he was spending on "shelter" he would probably have told you, well 50% of what I am paying to service the loan, and the other 50% is part of my retirement fund". He might also have told you that if he hadn't believed that house prices would go on going up forever, and he hadn't been able to get a 100% mortgage he would have bought a house half the size for half the price. Fast-forward to today and his house is worth say 50% of what he paid for it, but his cost of continuing to live in the house hasn't changed. Well he can hardly keep up the fairy story that 50% of the mortgage he is paying is an "investment", so he might say well 100% of the money I am paying is going to keep a roof over my head, because if I don't keep paying the bank will kick me out into the street. In that scenario, his "cost of shelter" has doubled, which is inflationary. The full "benefit" of the drop in house prices will only materialize for this person when/if he defaults on the loan and either rents a place for 50% of what he was paying to service the loan, or if he can get credit, buys a place for 50% of what he paid for (like the house he was living in the first place). That of course would be deflationary because the velocity of money originating from this person to circulate around the economy would halve. So by that logic, helping people to stay in their homes is inflationary and mass foreclosures is deflationary. That makes sense, if a system is set up that encourages people to pay double what they would normally pay for the essential utility of having a roof over their heads, on the "promise" that inflation would see them right, that's inflationary. Here's an idea, instead of giving money to bankers, why not just hand out the money to the people who borrowed money to buy homes they could not afford, it wouldn't make much difference really, just substituting one bunch of bankrupt people for another bunch of bankrupt people, the decision is just which bunch of bankrupts should have their pockets filled with the taxpayers money? That was an idea that was suggested before Secretary Paulson decided to buy up those toxic assets and it got sort of lost in the wash with all the excitement; and then he changed his mind. There would be two advantages of such a scheme, the first is that instead of a lucky few being able to gouge the taxpayer, the largess would be spread around, the second is that if that happened well perhaps those toxic assets would become liquid again (the reason they are not liquid is because people are defaulting on loans), and so that might actually end up being cheaper than handing over large sums of taxpayer money to PIMPROCK. And with any luck all the money floating around that would create a fantastic burst of inflation, which would wipe everyone's debts clean. An alternative approach would be for the government to offer to re-finance mortgages at 120% LTV and at the new low mortgage rate. Sounds crazy, but it's not, OK the "regulators" have finally awoken from their great slumber and they have finally figured out that allowing banks to write 120% mortgages to people who have no obvious source of regular income is about as smart as handing over car keys and whisky to your sixteen year old darling child. What they didn't figure out is that the horse is no longer in the stable, and so closing the barn door after it has bolted is almost as stupid. The point is that house prices are pretty near the bottom (I figure 15% to go at current consensus estimates of nominal GDP growth (http://www.marketoracle.co.uk/Article6811.html), and I'm not the only one, that's about the average of Professor Roubini's estimate (the main difference is that I explain how I got to that number, he doesn't, which of course doesn't mean he's wrong). Then, if the government manages to create some "good inflation" (I'm not sure there is such a thing but this is a war), and by doing this manages to unfreeze those toxic assets, well in two or three years time those 120% LTV mortgages will be 100%, and the owners will at least have some chance of paying them. But that would be too simple, and why would the government want to risk about half of the money that would be required under PPIP, to pay for the toxic assets twice (how that scam would work is explained in (http://seekingalpha.com/article/129639-ppip-watch-banks-as-bidders-and-sellers-hmm-remember-enron)). Recently Chairman Bernanke announced that "valuations are important". Well I always thought the guy was smart and that proves it...there you go Ben, you bet they are!! The point is that just because you don't measure CPI properly doesn't mean that inflation (or deflation) magically disappears, and just because you "assume" for the purposes of having an easy life that toxic assets are "liquid" when you calculate M2 or M3 or L or whatever number you use for the letter (M) in the equation, doesn't mean that they are liquid. Mm...so that perhaps explains why in July 2003 the International Valuation Standards Committee (IVSC) wrote to the Bank of International settlements pointing out that valuations used to assess capital adequacy were "fundamentally flawed and bound to be misleading". IVSC should perhaps have added CPI and (M) to that list? If the end game of the current confusion in USA is inflation then gold will head up towards $9,000 and all debts will become devalued to nothing, so the "problem" will go away. If not gold will head back towards $200 (presumably - although there is an argument that I don't understand that says not), in any event the "problem" will very definitely not magically go away, it will get much worse as people's debts valued in "real money" get bigger, and the prospect will be what Professor Roubini calls the dreaded Japanese "L". Which is why after years of creating inflation by accident (or stealth) the US government is desperately trying to do it on purpose. It's a pity they aren't as good at doing that when they try to do it, as they were when they weren't trying. Perhaps they should simply go back to sleep and things would sort themselves out on their own? Until then it's just a waiting game to see in which random direction the geniuses that created this mess (or allowed it to happen), will jump. Not exactly a great environment for making investment decisions, which might explain why that dead-cat-sucker-rally is still yowling away (Stock Market "Sucker-Rally-Dead-Cat" Still Yowling! Market-Long-Waves Say's "Bull-Run Warning") , there's no-where else to go. Getting inflation to pay off every ones debt seems only fair to those in debt. Who created this problem apart from the people involved in the stock market? Bankers got greedy, governments let it all happen with no regulation, and those now in debt thought they could enjoy themselves with other peoples money. Who is going to pay for this? yes the responsible people that saved. Let inflation pay off the irresponsible debts and savers trying to protect their savings and pensions will loose everything as well. How about making those that caused this problem pay for this mess? Put all those in government on the national minimum wage for 5 years. ( no problem as they set the minimum wage as adequate) Put all bankers and city workers on minimum wages for the next 5 years so they do not steal as much as they have been and are currently doing from investors. Let those that created this mess contribute fully to the recovery without penalising the responsible sector who choose to save instead.